We're always on the hunt for the best dog products available and we suddenly thought - what's the point in us knowing if we don't tell you? Continuing K9 Magazine's Best Dog Products series, we've been delving into the world of dog training and so selected a few of the best dog training essentials we think you should know about. 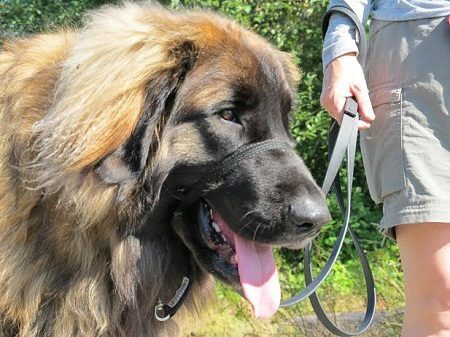 K9 Bridle – The world’s first dog bridle, guaranteed to stop your dog pulling with effortless control. The head collar is designed so it won’t ride over your dog’s eyes or mouth for added comfort. Amazing results in 10 days or your money back! Watch the videos and read the many K9 Bridle testimonials online! Barker & Barker Medium Liver Treats (pouch of 525) – These treats are an effective and healthy way of repeat rewarding your dog while you’re training. Available in six varieties, including liver, the treats are sold in pouches or pots of various quantities and in three sizes of treat which are small, medium and large. Dogness Anti-Shock Dog Leash – The perfect lead for owners of strong dogs, the style of this anti-shock leash means you use your back less when walking your dog. These leads are quick drying with a triangle handle. The handle is also anti-slip, safe, strong, and reliable. Available in short and long lengths. Rosie, below, is modelling the long length lead. Clicker Training eBook – Discover the dog training breakthrough that enables you to teach your dog anything! People often think of clicker training as a fast and easy way to teach basic obedience commands, such as “sit” or “come,” but it can also quickly shape your dog’s behaviours in ways that establish a productive and happy relationship, right from the start.